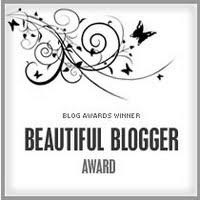 Janae, from Moss Family blog gave me this Beautiful Blogger award. Janae is my new blog-friend..I think we found eachother through Blog-frog...She has a beautiful family of girls! Lots of blond and pink over at her place! -Thank the person who nominated you for this award. -Copy the award & place it on your blog. -Link to the person who nominated you for this award. -Tell us 7 interesting things about yourself. -Post links to the 7 blogs you nominate. 2. I have raynaud's syndrome (very cold feet and hands most of the time) and so I am usually wearing gloves. If it's colder than 73 degrees, I'll be wearing gloves. In church, In July, even. (the air conditioner is not my friend). I wear fuzzy socks to bed, too. 3. My plane was put under quarantine for 3 or 4 hours in Japan during the swine-flu pandemic, spring of 2009. It was like being in the middle of that Monsters Inc. movie, where they come in dressed as haz-mat suits...crazy. Missed my plane out and had to stay overnight. I only have a face mask and memories to remember Tokyo fondly. 7. I worked at a Christian Bookstore, during my highschool and college years.